Average fees have gotten considerably worse at $74/byte. This is a meager 3000x the fees on the Bitcoin Cash chain. 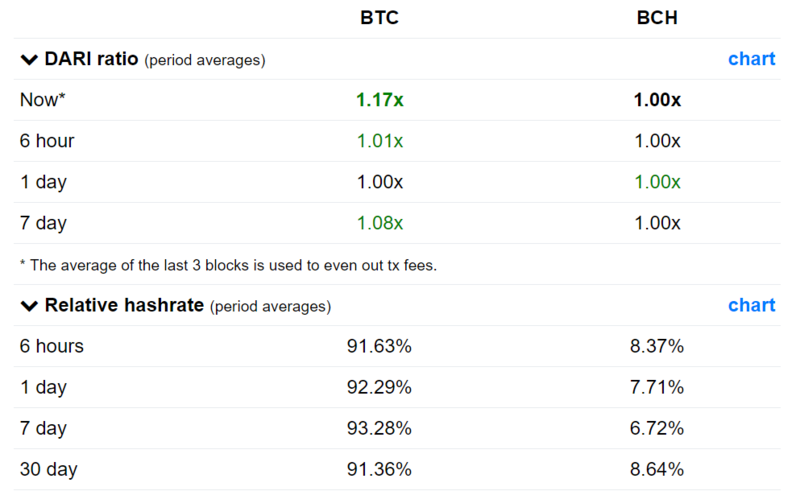 Please bear in mind that fees are calculated in satoshis per byte and not USD, so even when Bitcoin Cash is worth 10x the amount it is today, it will still be substantially cheaper than BTFee. At the moment, Legacy is 17% more profitable to mine, up from being relatively equivalent the last few days. This relative parity comes on the back of an absolutely colossal difference in fees made by miners between Legacy and Cash. And this is while BTC has been finding so many more blocks than BCH. It's also worth noting just how excellent the Bitcoin Cash Difficulty Adjustment Algorithm has been since the change. 6.00 blocks/hour is exactly perfect. However, Legacy has so much hashpower right now that it's finding 8 blocks an hour, even after difficulty is adjusted. If this trend persists for the next two weeks, difficulty will increase another 20%. Unconfirmed transactions remains stable at 150,000 support. However, it's worth noting that BTC is processing 9 transactions an hour at the moment, and if hashpower leaves, that number will plummet and this problem will quickly become an issue. Expect the conversation about fees and transaction time to accelerate like fire leading up to the new year. Since my TradingView post has been up for a few hours, let's get straight to the trade. I'm excited for this one! Wish I got a refund for one you deleted tho. I'll use it to buy the next article. @Aaron - That's most definitely something that's been on my mind to do lately. It'll take some time to prepare it, but it's definitely on the list. Love your work man ;) keep it up! The BT2 token are probably going up, because someone created this website for a planned Segwit2x hard fork http://b2x-segwit.io/. But the whole thing looks rather fishy. Even the names of the people disappeared and all the links to LinkedIn don't work. Additionally all social media profiles have no real people behind and some guy with zero online presence from Kiev is the registrar of the domain. My best guess is that he might just created the site, because he was still holding some tokens and finally wanted to get rid of them for a higher price. This was it man!! This was the one!! !